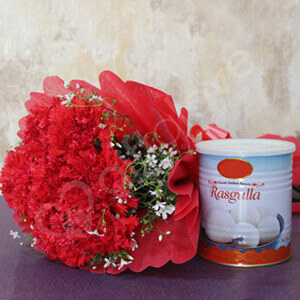 The green fillers in the bouquet are used according to its regional as well as seasonal availability. Ribbons and wrapping paper of the bouquet can be recycled for decorative purpose. Roses were used for decoration by the ancient Romans. They even wore garlands made out of this flower around their neck. Juliet Rose is a species of the flower that costs more than a million! Make a hearty confession to someone very dear and loving on any special day of the year with this attractive gift combo. It will definitely give an overwhelming experience to your dearest one. No wonder your special one is sure to feel very loved and cared with this delightful gift combo of roses and sweet Soan Papdi. The yellow flower were very pretty. The combo was delivered to me on the estimated date of arrival. Will buy more gifts only from here!